Chennai, 25 November: Hopes of a 64-year old woman from Bahrain were kept alive at Global Health City with an implantable artificial lung, for the first time in India such a device had been used as a bridge to lung transplant. By introducing this new technology to India, Global Health City offers a glimmer of hope to thousands of patients with end-stage lung failure. With this innovative technology, the waiting time to receive a donor lung is extended. Mrs. Fatima Mohammed Ahmed, underwent a lung transplant at Global Health City 3-years ago after her lung condition went bad due to Lymphangioleiomyomatosis (LAM) - a rare lung disease that tends to affect women in their child-bearing age. Post the transplant, she recovered well and returned to routine life within 2-months. Things had been looking good and under control since then with regular follow-up and appropriate medication support. Unfortunately a year ago, she developed a fungal infection in her lungs, which led to Bronchiolotis Obliterans Syndrome (BOS) - a fibrotic process resulting in progressive narrowing of bronchiolar lumens and airflow obstruction, is a manifestation of chronic allograft rejection. Having affected by BOS, Mrs. Fatima was prescribed with a series of medication regimes such as Anti BOS drugs, Immuno Suppressive Medications, etc. and the condition of her lung was closely monitored. Almost 10 months after she developed BOS and with medical management, her lung did not show any sign of improvement. “In the case of Mrs. Fatima, we had to offer the best possible support that buys her time to revive her condition and to wait for donor lung to become available. Considering the situation, our expert team decided to use Novalung, an Implantable Artificial Lung device. It is a pumpless device that needs minimal monitoring in the ICU and patient can be ambulated easily with the device in place which is not possible with ECMO”, pointed out by Dr. Rahul Chandola – Senior Consultant Heart & Lung Transplant Surgeon. “I am very much thankful to the doctors at Global Health City for offering me another chance to live my life and to spend time with my family. When I came here with a failed lung condition, I and my family had a very little hope. Now with the artificial lung device implant, I am waiting to receive a donor lung and I am confident of starting a fresh lease of life again shortly”, said by Mrs. Fatima. It is a breathing support system which is designed to support the exchange of gas in the lungs of the patient. The system removes carbon dioxide from incoming blood and Infuses oxygen into the blood thereby increasing oxygen levels. Clinical application of this device is indicated in the situations where strict application of lung-protective is performed and where there is insufficient exchange of gas, in particular insufficient removal of carbon dioxide. As one of Global Hospital’s cornerstone Centers of Excellence, Heart & Lung Institute is a premium, comprehensive center providing innovative, quality care close to home. Utilizing advanced medical and surgical equipment, the expert team of physicians and nurses practice evidence-based medicine blended with patient-centered care. From intervention to cardiothoracic surgery and rehabilitation, the institute’s approach hinges on personalized care, recognizing that every patient is unique. 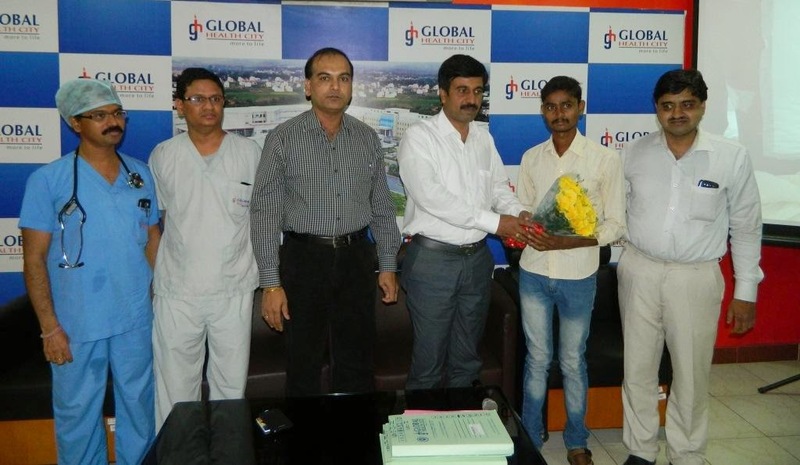 A rare & critical heart surgery saves a contract labourer’s life..
23 year old Ganesan met with an accident, rushed to Global Health City with acute cardiac rupture; a high end complex heart surgery removed 2 liters of accumulated blood. Chennai, 19th November 2014: Ganesan a 23 year’s old generally fit contract labourer, native of Salem met with an accident at a construction site and became unconscious. After first aid and due care, he was presented with critical heart injury. Investigations revealed an acute heart rupture and Temponade (compression of heart due to blood in the pericardial sac). Patient required an emergency open heart surgery to solve the acute rupture. 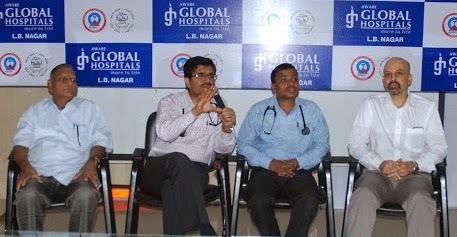 Open Heart Surgery: The Patient underwent an emergency surgery on 5th Nov. During the surgery around 2 litres of blood accumulated on the pericardial cavity was identified and his heart function was compromised due to severe cardiac Tamponade (compression of heart due to blood in the pericardial sac). As soon as surgeons opened the pericardium they sucked the blood with special blood recycle machine (Cell saver) and transfused the same to the patient again. After relieving the cardiac rupture measuring 3 cm at the left atrial and left pulmonary vein junction was repaired, and the patient survived the injury.